After seeing a caterpillar transform into a butterfly in second grade, Jesus Martinez-Gomez fell in love with biology and the beautiful science of living things. He grew up in Ferndale, WA with parents who emigrated from Mexico. Jesus chose the UW when his high school guidance counselor mentioned that it was the best place to study the sciences, but he never imagined where this seedling interest in science would take him. 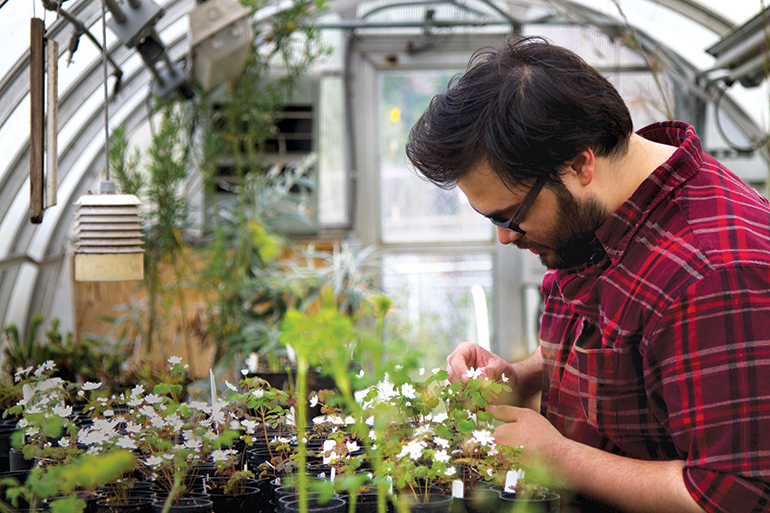 During his four years as an undergraduate researcher in Molecular, Cellular, and Developmental Biology, Jesus studied the mutation of genes in flowers in Dr. Veronica Di Stilio’s Lab. From sequencing the genes of flowers to writing and presenting scientific papers, Jesus not only learned about biology—he gained vital scientific experience that prepared him to thrive as a career scientist. Jesus has been accepted by numerous prominent graduate programs and will pursue a Ph.D. in biology after graduation. His tremendous success as a student and scientist at the UW has been made possible by numerous scholarships and UW programs that have given him the resources to thrive. To learn more about Jesus and his UW experience, watch his video profile. You can empower students like Jesus by supporting undergraduate scholarships in Biology, ensuring that regardless of means and background, the most promising and dedicated students are granted meaningful educational and research opportunities at the UW.